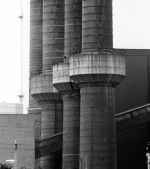 The famous 'Goldenberg Werk' power plant started operation in 1914. 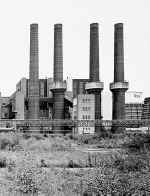 It was Europe's largest power plant at the the end of the first world war. Once the twelve chimneys were called the 'twelve apostles'. Only four of them (the four evangelists?) do still exist.